Here’s a letter I received a few months ago. At first glance, it looks like invitation to renew my domain. Only it isn’t. This isn’t the outfit who registers my domain, so they are obviously trying to “steal” my business. It appears to have been written by a lawyer, as much of the verbiage is meaningless (“now is the time…”), or a statement of the obvious (“You must renew your domain name…”), with an occasional scare tactic thrown in (“Failure to renew…”). The letter exhorts me to reply by 10/16/2008, though the registration does not come up for renewal until next February. Huh?? Thirdly, and most curiously, their rate is $30/year, compared with the $9/year I am currently paying. You don’t know us. 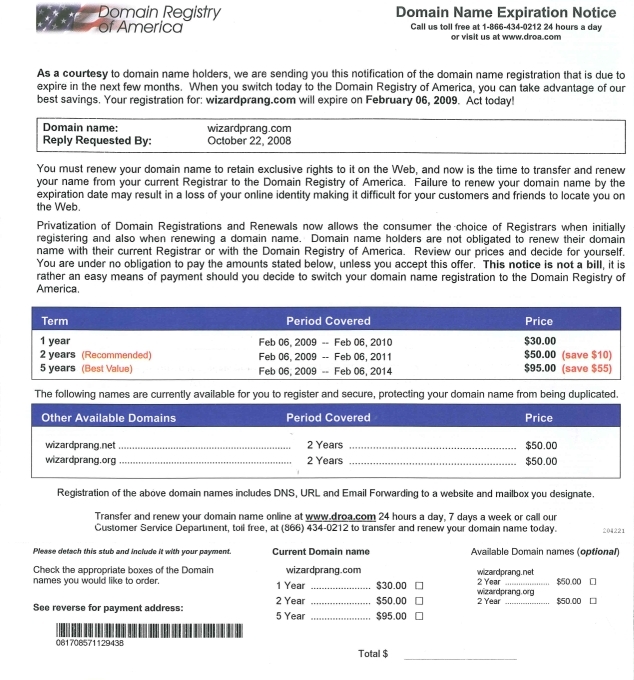 We are Domain Registration of America. We would like to poach your business from your current registrar, and we’re going to charge you more than three times as much as you are currently paying. What a great deal – sign up now!! This is not a bill, though it sure looks like one. Not so impressive now, is it? And the moral of this story is: Read the small print. Not long ago, I opined that the bailout bill was a bad idea. Recently I found out that some recipients are using their “bailout money” to buy up the competition. Sigh… I’m sick of being right. Looks like the lunatics really have taken over the asylum. The entire board, must resign. No golden handshakes, no golden parachutes, no golden nuthin’. Senior management (CxOs) must go. If the company is in need of a Government bailout then it is self-evident that the overpaid bozos in charge obviously cannot manage their way out of a paper bag. That being established, why should they be allowed to keep their jobs? Same deal as above (personally I think that they should be charged with criminal negligence, but that’s just me). The government should acquire a 50% stake by issuing extra shares equivalent to the shares currently in circulation (shareholders take a 50% hit). The company must submit a plan to the Government stating why they need the money, what they intend to so with it, and how it will help them stay afloat. I can’t think of any more off the top of my head, but that’s a start. Meanwhile, back at the palace… now they’re talking about bailing out the big three US Automakers. Remember them? They were the ones who were trying to sell us big honkin’ SUVs and trucks while Honda, Toyota and the rest were bringing out smaller and more innovative vehicles. They were they ones who have been dragging their feet on electric vehicles, even though they had a workable technology on the streets twelve years ago. Instead, they fought it, buried it, and started selling us on Hybrids, a jack-of-all-trades-and-master-of-none technology that serves to keep their service bays profitable (electric vehicles have practically zero maintenance compared to Internal Combustion Engines), and their buddies in the oil industry fat and happy. They sat on their collective backsides while a tiny startup came out of nowhere and beat them to market with an all-electric supercar. And we’re supposed to support that?” No. Just… no. I say let them collapse – “For they sow the wind, and they shall reap the whirlwind”* comes to mind – and give the bailout money to the employees, to be used as venture-capital by the startups that employ them. Startups that will make the kinds of cars that we actually need. *That’s Hosea 8:7, in case you were wondering. Most of the people in our society are sheep. They are kind, gentle, productive creatures who can only hurt one another by accident. Then there are the wolves, and the wolves feed on the sheep without mercy. Until the wolf shows up. Then the entire flock tries desperately to hide behind one lonely sheepdog…. Today, of all days, I give thanks to the sheepdogs. To those on duty, I pray that their courage will not fail them. To those who have gone to the great Kennel in the Sky, rest easy. Job done. For the past couple of weeks I have been saying that “Obama will win, by a significant margin, if not a landslide“. That’s the third time in a row I have correctly forecast the outcome of a Presidential Election. Self-praise aside, I am glad that the squawking is finally over for another four years. I am glad that the difference was so pronounced that nobody can accuse anyone of “stealing” the election. I’m glad that Hillary did not get in (sorry, but she scares me). Most of all, I am glad that for the first time in twelve years, Florida didn’t matter. We watched both the concession and victory speeches. Both were uncommonly civilized and seemed heartfelt. McCain responded with humility and no bitterness, and even silenced the booing from his supporters. Obama, as always, was in top form; it’s a shame that his grandmother did not live to see his finest hour. I pray that our new President-elect does the right thing once in office, and that he really can be as effective as the majority of the voters think that he can be. I also hope that the “Change we can believe in” is also a change we can afford. Taxation should never be used as a form of class warfare. Not long ago, I blogged that the nomination of an African-American as a Presidential Candidate was proof of the greatness of America. This holds doubly true of his election. For those of you who were wondering, the title comes from a pronouncement by a seven-year-old niece (Hi Mak!!) who has been avidly following the Presidential Election. She even knows the Candidates are “Rockabama and… the other guy“. The fact that she lives in Illinois might have something to do with it.